From the publisher: Part memoir, part master class by one of the bestselling authors of all time, this superb volume is a revealing and practical view of the writer’s craft, comprising the basic tools of the trade every writer must have. 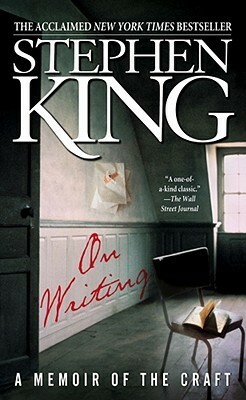 King’s advice is grounded in his vivid memories from childhood through his emergence as a writer, from his struggling early career to his widely reported near-fatal accident in 1999 — and how the inextricable link between writing and living spurred his recovery. Brilliantly structured, friendly and inspiring, “On Writing” will empower and entertain everyone who reads it — fans, writers, and anyone who loves a great story well told. Why I LOVED it: I’ve got a stack of writer’s reference guides on my shelf, and this one is – by far – the most inspiring. I have always admired Stephen King’s God-given talent for storytelling, but now I have a deeper appreciation for his work. This book isn’t about writing and selling books per say; it’s more about writing with joy and authenticity. This quote from the tail end of the book pretty much explains it all. On Writing is also somewhat of a love story between King and his wife, Tabitha. The first half chronicles his early years as a fledgling writer, including that fateful day when he fell in love with Tabitha in a creative writing class. He was mesmerized by her lyrical poetry and it was love at first sight. Oh swoon! Does it get any more romantic than that?!? Stephen King fans have a lot to thank Tabitha for supporting his writing even while they were on the verge of collecting food stamps. She also saved Carrie from a landmine. Who knows what would have happened if his first bestseller never came to be? Throughout the book, he waxes poetic about his literary soul mate, and it just made me love him more and more! This book is not, by any means, a quick writer’s reference guide, but he does throw in some of the most valuable writing tips. One crucial piece of advice: If you consider yourself a writer, you must be an avid reader. I wholeheartedly agree that those who rarely read have no business writing. Also important: You must write for yourself. If you’re trying to please others – or to just make money – you should find a different path to notoriety. And whatever you do – stay away from those darn adverbs! Adjective modifiers are for lazy writers – and Stephen King hates them with a burning passion. Most importantly, believe in yourself. Ignore the naysayers and keep pushing forward. The narrator: Who better to narrate this book than Stephen King? While listening to this book, I closed my eyes and imagined myself sitting across from the world’s greatest horror writer and learning the ropes from the dark master himself! My only complaint is that I can’t highlight or bookmark an audiobook, so I’m going to have to buy the hard copy as well. This is definitely a book that I will revisit often. Summed up in three words: Inspiring, authentic, fascinating. Posted on October 21, 2013 by Bubble Bubble Books and Trouble •	This entry was posted in Memoirs and tagged Carrie, On Writing by Stephen King, Stephen King, Writing books, Writing guides. Bookmark the permalink. You are such a thorough, insightful and riveting book reviewer!